Come celebrate dance with us at our annual spring concert! We are gearing up for our 22nd year of MDT! Our talented and dedicated instructors, Ivy Farrell, Amy McDonnell and myself are offering new classes for all ages: Creative Movement for ages 3 1/2 through 6, Modern Technique for ages 6- 21, Beginning through Advanced. Come take a trial class to determine placement and experience movement exploration and the joy of dancing in a knowledgeable, nurturing enviroment. Late Summer Greetings! I hope this letter finds you all well and enjoying the summer. It is once again time to register for Modern Dance Technique. Those students who were able to attend our summer session had a great time dancing this summer. New exercises and movement combinations provided insight into what the different levels will be working towards during the upcoming year. Instructors Ivy Farrell, Amy McDonnell and I are looking forward to a great year of classes for all of our returning and new students. We are pleased to be offering new classes and increased dancing and performance opportunities to all of our students who desire to deepen their knowledge and skills in Modern dance! This year I will be teaching Creative Movement, Introduction to Modern; Beginning and Intermediate, Modern II Intermediate, and Modern V/Pre-Advanced. 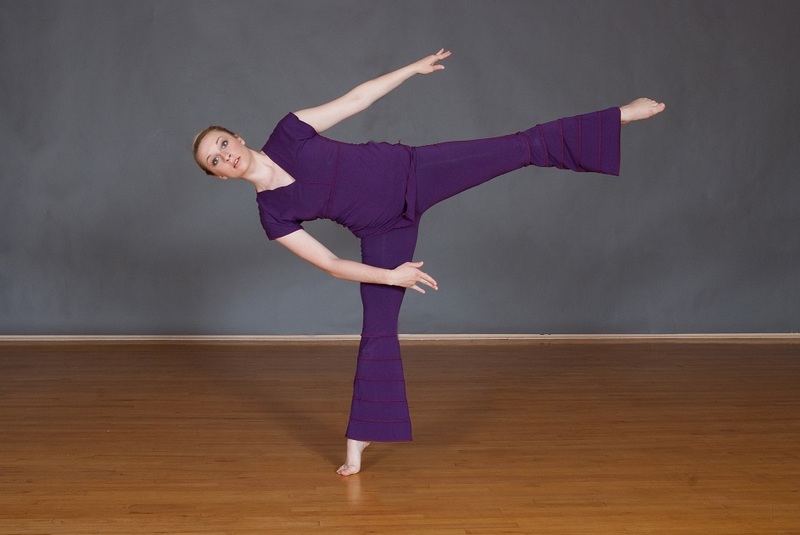 Ivy will be instructing Creative Movement, Teens Intermediate Modern and V/Pre- Advanced. Amy will be offering a class with admission based on audition for our V/Pre-Advanced dancers; the goal being the creation of an additional dance for performances. Dancers in all levels are offered the opportunity to take additional classes each week. Please contact me to discuss which additional classes would be appropriate if you are interested. Placement in classes is determined by technique and readiness for a particular level of dancing, the number of dancers at or near the same level, and the availability of studio time. This is one reason why dancers may spend more than one year in a level, or in some cases; a dancer may dance with one group for a year and another group the next year. Our program continues to prioritize the development of our current and returning students. It is a challenge to design a schedule that works for our students, instructors and the availability of affordable studio time. From my perspective, all dancers who attend their classes regularly are constantly improving. Each year their understanding of movement deepens and their technique gets stronger. As always feel free to contact me if you have any questions or concerns about your dancer’s progress or placement. Tuition is due the first class of each month, September through May. No tuition is due in June. Please mail your tuition to me or it can be dropped in the envelope on the table at the Odd fellows’ studio. We do not send billing invoices for tuition. Electronically generated payments are accepted.Tuition is accepted for a term’s classes: Sept- Dec, Jan- Mar. and April-May. Payment in this manner can be more convenient, particularly when the parents do not accompany their child to each class. Tuition is also accepted for the whole year. Please be sure to pay tuition before the 15th of each month. I am not comfortable charging a “late fee”. Following up on late payments is very time consuming and stressful. If the payment policy poses a problem for anyone, please contact me to make other arrangements. Proper dance attire is required at Modern Dance Technique. Although it does not need to be a specific color, dancers should wear a leotard and footless tights to class. Street clothes, sports attire, dangling jewelry, baggy clothes, midriff shirts and costumes are a distraction to the dancer, the instructor and the class. Dance attire can be purchased at The Glass Slipper on 2nd St. in Corvallis, or online at Discount Dance.com, Online Dancewear, or backstage.net. Dancers should only enroll in a class that they can attend consistently. I realize there are many activities available to our students and it can be hard to choose. Each class is built upon what the instructor has presented in previous classes, so with frequent absences the dancer can fall behind or risk hindering the progress of her classmates. If you are having scheduling conflicts, please contact me before registering. It is also very important that the dancer be on time at the start of each class because much of the foundation for movement is covered during our opening exercises. Please be aware that excessive lateness or absence can result in the dancer being asked to change classes or to be unable to perform in our recital. Our 22nd Annual Spring Celebration of Dance will be Friday June 7 and, Saturday June 8 2012 at 7:30pm. Our dress rehearsal will be Thursday June 6 at 4:30 pm. Tech rehearsals will begin Saturday June 1. Please be aware of our performance preparation schedule and contact me as soon as you become aware of dates for other end of the year events; hopefully we can avoid scheduling conflicts. 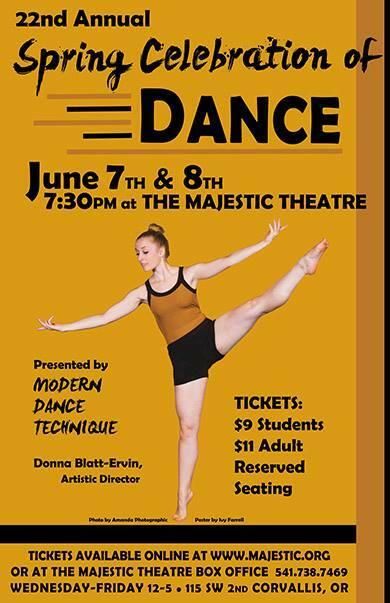 This year I will need to charge a small recital fee for each student dancing in our recital at the Majestic Theatre. The fee will be due at costume purchase time; in late January or February. Dancers in the Modern II Int. or Modern V/Pre Advanced class who are looking for additional time dancing may be interested in being a “helper” for some of our younger classes. It is great training; our strongest dancers have been ones who spend time helping the lower levels with their technique. Many have returned to teach classes and workshops for us as well as utilizing their teacher training skills in their college dance programs and other studies. They have found the experience of mentoring the younger dancers to be fun, challenging and highly rewarding as well as helpful to me! A tuition discount may be earned after a training period. Please contact me if you are interested in being considered for these positions. Please feel free to contact me if you have any questions or concerns regarding scheduling or placement. Ivy, Amy and I are looking forward to the coming year’s classes. We are truly grateful for the opportunity to share our love of dance with so many wonderful, enthusiastic and talented students. Summer is a great time to take class whether you are a serious year round student, a new dancer curious to see what goes on in a modern dance class or someone who hasn’t danced in a while and wants to get back into top form! We have classes for every age and experience level. For the youngest dancers starting at age 3 ½ through kindergarten; Creative Movement provides the opportunity to use movement for personal expression. It introduces early dance moves in a traditional class setting. 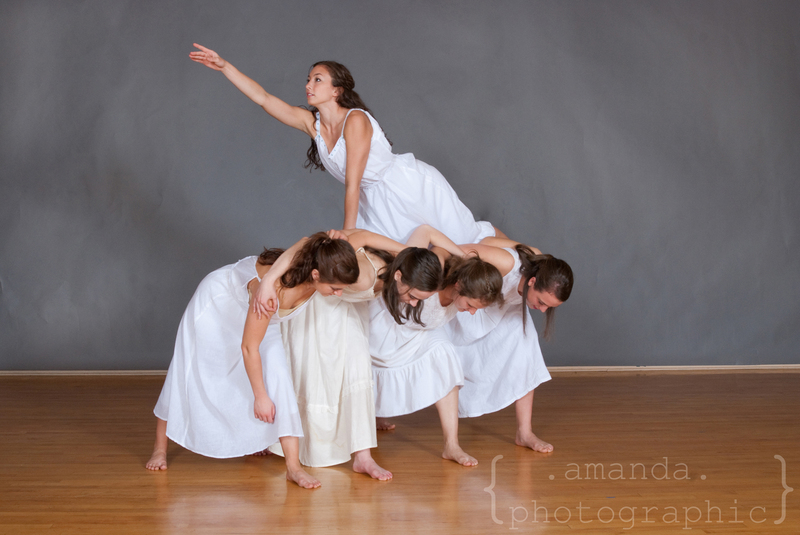 Exploring shapes, size, tempo, pathways and rhythm allows the dancers to explore the world around them through movement. Basic dance exercises are learned as the youngest dancers celebrate their growing bodies and expanding movement repertoire! 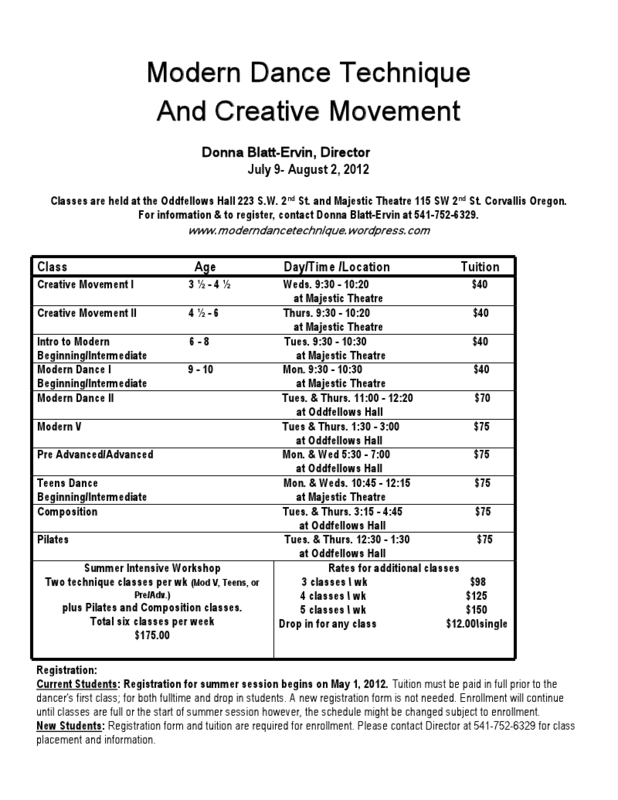 Introduction to Modern and Modern Dance I build upon the concepts presented in Creative Movement. The dancers are encouraged through movement exploration to discover new ways of moving their bodies while gaining strength and learning basic dance technique. All technique classes include floor work, technique exercises in the center such as foot work, swings, jumps, turns, leaps and movement combinations across the floor. Modern II through Advanced keeps building on previous movement concepts. More difficult and technical exercises are added as the dancers begin to develop their artistry. 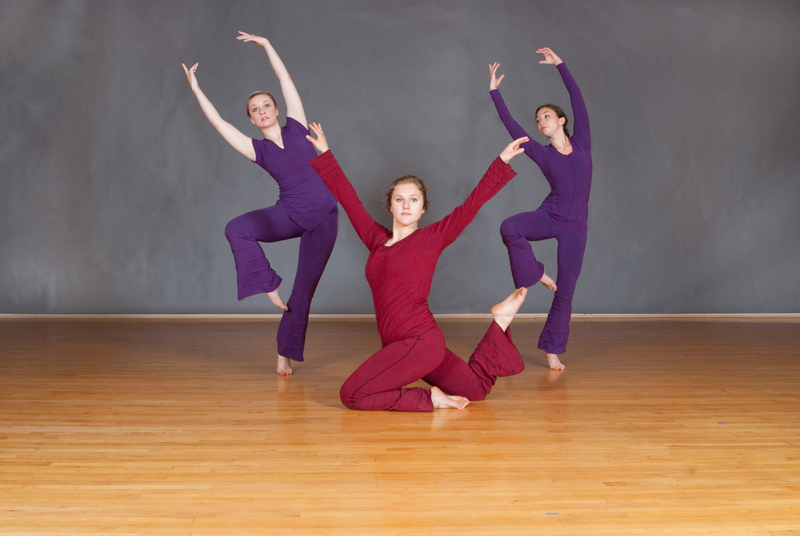 Advanced dancers are provided with enrichment workshops with master teachers and performance opportunities. Teens dance allows the older beginner to learn dance technique at a level suitable to their physical and emotional maturity. 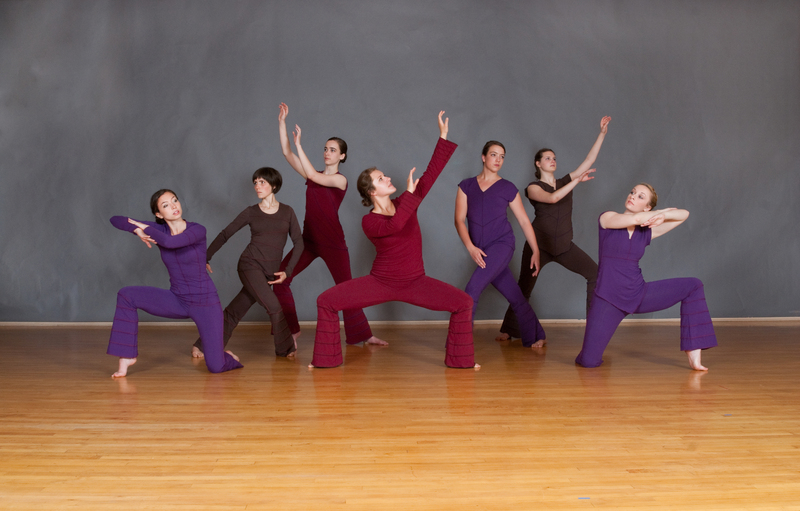 Modern Dance Technique specializes in the traditional modern dance techniques of Martha Graham, Lester Horton and Jose Limon as well as current contemporary and post- modernmovement principles recognized for quality dance training. Summer dance classes includes Pilates for Dancers which greatly assists in core strengthallowing for stronger technique. Composition is for the serious dance students who want to learnhow to choreograph thoughtful, engaging movement. Our dedicated instructors include director Donna Blatt Ervin, teaching Creative Movement and all levels of technique; Amy McDonnell, MFA in Choreography and Performance, certifiedPilates instructor; teaching all levels of technique, Pilates and Composition; and Ivy Farrell BA in Dance and alumna of MDT teaching all levels of technique. Summer teaching staff also includes other alumna of MDT currently working or studying at higher levels in the dance field, who happily return to join us as guest teachers. All students who include dance class as part of their summer activities are rewarded with greatgains in their dancing abilities and fun times with old and new friends in our studios. Every student who attends finds themselves inspired with a renewed love of dance and they are always eager to come back to classes in the fall as well as the next summer session. Come see our annual recital The 21st Annual Spring Celebration of Dance!! This years concert features choreography by Artistic Director Donna Blatt-Ervin, Amy McDonall, Ivy Farrell (alumni) and Mara Bateman (alumni). Our classes are under way and we are all enjoying our time in the studio. The younger dancers are learning modern dance movements and enjoying their creative movement explorations. Ivy’s classes are becoming familiar with her vocabulary, learning new variations of exercises and working on developing movement phrases for choreography. 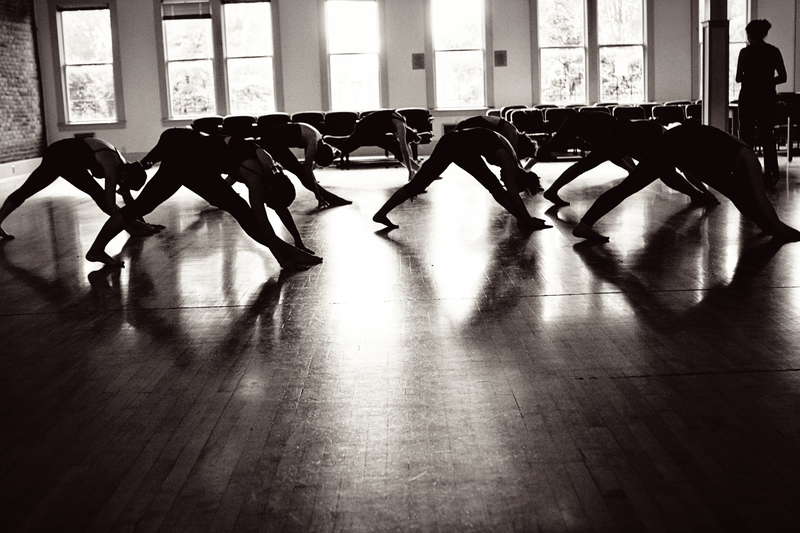 Amy and the advanced class are deepen their understanding and range of modern movement, getting stronger each week. I am enjoying being back in the studio with all of our dancers, sharing the joy of movement with our next generation of younger dancers. I also relish in all of the different techniques, Graham, Horton and Limon that the dancers are studying. Their knowledge and understanding of the many aspects of these wonderful”languages” are expanding and I am so proud of their strength and technique. Class schedule for 2011-2012 is available online! Make sure to check out our Class Schedule and note that we accept students 3 1/2 and up! We are planning classes and gearing up for a great start to the new school year!